South Sudan's ex-vice president and former rebel leader Riek Machar is pictured during an interview with Reuters in Rome, Italy, April 12, 2019. REUTERS/Yara Nardi. 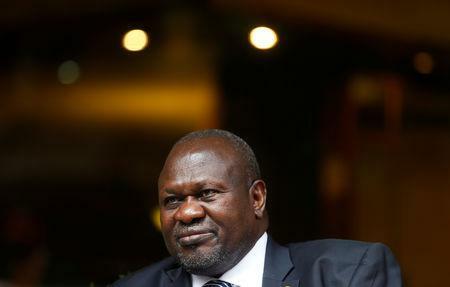 ROME (Reuters) - The two sides of war-ravaged South Sudan will not be able to meet a May 12 deadline to form a unity government because key requirements of a peace deal have not been met, former rebel leader Riek Machar told Reuters on Friday. Although few diplomats expected Kiir and Machar to meet the May 12 deadline set in last September's peace deal, the delay will cause further unease among the 12 million strong South Sudanese population. Asked if he thought the national unity government could be ready by May 12, he said: "Unfortunately, I have to say 'no'." "We have refugees who will not return if they don't feel secure, we have IDPs (internally displaced people) in the capital and in other major cities who will not go back to their homes which they have left five and a half years ago because of security problems," he said. "So we need to establish adequate security from the two forces so that our people can have confidence that this agreement will hold. So it is unlikely that we will form the government by the twelfth of May," he said. Machar said Kiir "is concerned that the international community will target him for not implementing the agreement". He added: "But he has to carry his cross on this." "The delay is inevitable, as there is no real alternative. However, there will be little expectation that it will yield any real progress absent external pressure or an unforeseen change," Klem Ryan, former coordinator of the U.N. Security Council Panel of Experts for South Sudan, told Reuters. "I don't think it's cynical, it's practical. If a delay makes Machar feel more secure and ends the war, it will be worth it," Peter Martell, an author of a history of South Sudan, told Reuters. Machar also said he is confident that the new military leadership in Khartoum will continue to be "a strong guarantor" of the fragile South Sudan peace deal. The Vatican, together with the South Sudan Council of Churches and Archbishop of Canterbury Justin Welby, head of the worldwide Anglican communion, brought the leaders together for prayer and preaching inside the pope's residence in an attempt to heal divisions. "It was a unique occasion and it was concluded by Pope Francis with a challenge. The pope challenged us. We must deliver," Machar said.